Needless to say, software can’t be shipped to customers without testing it thoroughly. There are multiple ways to test an application - manual tests, automated integration tests, automated unit tests, performance tests and a few other techniques. Each of these techniques test different aspects of the application. Of these, unit tests are always written by Developers. Unit test is the technique that tests a piece of code in isolation. The piece of code has to be independent of any possible side effects when a set of unit tests are run on it. Unit tests play an important role in software development. They help in catching the bugs early and ensure quality of the code. Unit tests also provide documentation for the code. If a file has enough number of unit tests and each test is described well, a new developer in the team would be able to understand code in that file, without any extra effort. Not every piece of code written is unit testable. The code has to follow a set of conventions so that it can be isolated while testing. Testability of the code depends on the code itself and the platform on which the code is written. Angular is built with testing in mind. The modular architecture and the way Dependency Injection works, makes any of the Angular code blocks easier to test. This tutorial will show how Angular CLI sets up the environment for unit testing and then shows how to test Angular components. The default framework used in this project is Jasmine. The package @angular-devkit/build-angular contains the logic of building the webpack configuration for tests. 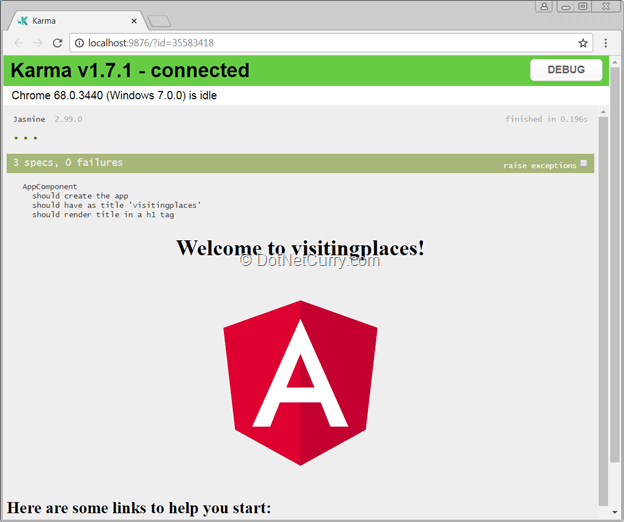 It reads the angular.json configuration file and prepares the objects for running karma. Plugins are the set of extensions we need to run the tests. Every framework configured in karma should also have a plugin added, so the list includes a plugin for Jasmine and one for @angular-devkit. Karma also needs providers for the browser to be used, to generate test reports and to generate the code coverage. These plugins are configured using their respective NPM packages. The coverageIstanbulReporter option contains the path where the coverage report has to be stored, the type of reports to be generated. Rest of the configuration options set the reports to be generated after running the tests, port number on which Karma has to run, to keep karma watching for changes to the files, the browser to be used to run the tests and the singleRun option tells whether to exit after running the tests once. As the tests run on Chrome, a new instance of Chrome pops up with the URL set to http://localhost:9876 while running these tests. The page on the browser shows the list of tests executed and their status. Change the browser options to use ChromeHeadless. As the configuration shows, the custom launcher opens chrome in the headless mode. The browser won’t be visible on the screen, but the Chromium engine would be used in the background to run the tests. On running the tests now, you will find similar result on the console. The only difference is, you won’t see a new instance of the Chrome browser now. Hence, debugging would be difficult. This is OK as we won’t use a CI/CD server for debugging. The code generated by the Angular CLI contains tests for the AppComponent. Reading the tests in this file would provide a good starting point. 1. Statement 1 imports the TestBed and async objects from the package @angular/core/testing. The TestBed object is used to initialize the testing environment for an Angular object. The async method is used to wrap a piece of code in a test zone. It detects any asynchronous calls made in a block of code and completes the test when all the asynchronous calls are complete. This test simply checks if the component instance is created. It creates the fixture of the component using the TestBed.createComponent method. The debugElement property of the fixture object provides all the required debugging APIs of the component. The componentInstance property of the debugElement is used to get object of the component and then the assertion checks whether this object is created. This test checks if the h1 element in the template is correctly rendered. The h1 element contains a binding expression that binds the title property of the component class. Angular updates the bindings in the template when the change detection runs. The fixture.detectChanges method runs the change detection on the component and updates the bindings. Now we need the root DOM object of the component. This object will be used to query the elements containing bindings and then to check if they contain the right data. Fixture.debugElement.nativeElement gives the DOM object of the component. All the standard DOM APIs can be applied on this object. The h1 element is selected using querySelector and then the test checks if it has the right content set. The tests generated for the AppComponent are integration tests as these tests are based on the component instance. The test is not using shallows as the template of AppComponent doesn’t contain any other directives or components. We will discuss the other techniques in the next section. The tests generated in Angular CLI provided some foundation to write tests for the components. Now let’s write tests for a few components that cover more real-life scenarios. If you want to follow along with rest of the article, use code in the folder named before from the sample code. This folder contains a simple Angular application with two components: PlacesComponent and PlaceComponent. The PlacesComponent contains a select box with a list of places. It passes the selected place to the PlaceComponent as an input parameter. The PlaceComponent displays details of the place it accepts and raises an event when the button in the component is clicked. In this section, we will write tests for both of these components. The PlaceComponent accepts a place object and displays the details of this place on the screen. It emits an event when the Button is clicked. Let’s test the functionality of this component in the three ways discussed earlier. To write these tests, add a file named place.compone.spec.ts to the app folder. If you are following along and writing the tests, have the ng test command running on a command prompt to see the test results as you make the changes. As you see, the beforeEach block creates an instance of the PlaceComponent class and sets value to the property place. The PlaceComponent class has the property IsVisited. It returns Yes if the place is visited and No if the place is not visited. The above beforeEach block creates the component fixture using a test module and then gets the root element of the component. To get it, it queries the debugElement using the By.css predicate. A more useful test would be to check the behavior of the component after changing the data it accepts. Notice the call to detectChanges after setting the value of place. Bindings in the component are checked again and the view gets updated if state of the objects has changed. When the button is clicked, the component raises the toggleVisited event. This can be tested by triggering event on the button using the DOM API. In an application using the PlaceComponent, the input property would be sent from the host component and the output event is also consumed by the host component. In the sample application, the PlacesComponent hosts the PlaceComponent. It would be good to test this functionality using a mock host component, as that would really test if the PlaceComponent interacts correctly with the host. The setup of this test suit will be different, as it will create a mock component. The mock component would be declared in the test module along with PlaceComponent. And the test will create a fixture object using the mock component instead of the component to be tested. As you can see, the component TestComponentHost uses the PlaceComponent in its template. It binds a value to the selectedPlace input property and binds a method with the output property toggleVisited. The fixture object is created using TestHostComponent. The tests will manipulate data using the fixture object and state of the DOM would be asserted using root element of the PlaceComponent. The PlacesComponent uses the service PlacesService and the PlaceComponent in its template. Both of these have to be mocked while testing the PlacesComponent. It also uses the built-in directive ngModel on the select element. As it is a built-in directive, you may load the Forms Module to the test module and test the component with the behavior of ngModel. While testing a component that uses a service, the service has to be mocked. This is done to isolate the component from any side effects that the service could cause. The service is replaced with a mock implementation. To create the mock effectively, use the provider name of the service and assign it with a different class, factory function or an object. The service is mocked here using the useValue provider. The mock object created has the public members of the PlaceService class. It assigns a static array to the places property and a Jasmine spy method to the toggleVisited method. Observe the statement that’s used to get instance of the service. Injector of the component is used to get the service instance and the injection token is passed to the injector.get method. By default, the PlacesComponent selects first item in the places array and it is passed to the place component. 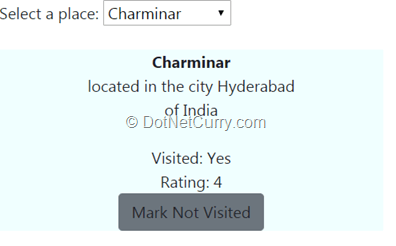 The next test verifies if the place component has received the right place. Unit testing is an important aspect to test applications as it ensures quality of the code along with reducing the possible bugs. As shown in this tutorial, Angular makes the process of testing easier by isolating each block of code from the other and by providing a number of helper APIs to work with the framework while testing. Components handle the most important aspects of an application and they have a lot of variations. Hope this tutorial got you started with testing different types of components. The future articles will discuss unit testing of other code blocks.